The Boxer rebellion happened in China around the end of the 19th and beginning of the 20th century. In a nutshell, Catholicism was spreading throughout China aided by a weak Chinese government. During this time, young Chinese took to slaughtering foreigners and Chinese alike in their attempt to reclaim their lost culture. While they were doing this they also managed to destroy their culture. All around it was a very ugly scene. 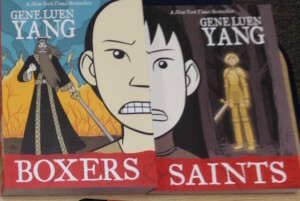 The stories in the graphic novels Boxers and Saints explore both sides of that time through two different viewpoints, the Boxers (young Chinese rioters) and the Saints (the Chinese who embraced Christianity). Both books were written by Gene Luen Yang and were published in 2013. You may remember his name. He wrote the graphic novel, The Shadow Hero, that I wrote about a while back. Though the stories are told in different ways, they really should be read together. Personally, I read Boxers first. Boxers feels like a study of ancient superheroes. The young Chinese are disillusioned with the power of their government so they take up vigilante justice to write the wrongs done to their people. To drive home the point the young men who follow the path of the Righteous and Harmonious fist have found a ritual that ties them to their ancestors. It is this tie that fuels their fighting abilities and allows them to make their way to the capital of China. As if that weren’t enough, the girls who follow the path of the Red Lantern join forces with the boys and together the two groups dispense “justice” as only a mob of people with swords and farming implements can. Notice that the girls and the boys fight side by side here, well, not quite. This story doesn’t focus as much on the private lives of the Chinese. Instead the focus is on the struggle. The only glimpse the reader actually sees of what their life is like is how the men and women remain separate though they fight for the same cause. The male fighters and the female fighters stay within their own groups as they slash and slice their way through the foreign devils. The viewpoint of Boxers is told through the eyes of Little Bao. He is the youngest son of a farmer who lives for the stories told in the opera. Little Bao goes from romantic fancies about Chinese emperors to the leader of the rebellion. 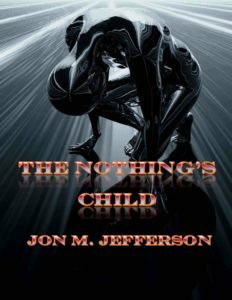 Within the story he struggles with the need to save his people and the need to destroy anything that brings his people down. Many of his battles are with himself as much as they are on a battlefield. But this viewpoint changes with Saints. This story is told more like a memoir, the story of fourth-girl and her struggles growing up Chinese. Her grandfather decided she was unworthy of a name because the girls born before her died and he expected her to die as well. Like many of the woman at the time she was not nearly as important as the boys and men in the family. Through all of this she has a driving need to find out who she is. It is only through her acceptance of Christianity that she begins to figure out her place in the world. Though her life isn’t much better than before she now has a name. She took the name Vibiana, something to call her own. Much like the destruction that the reader finds through the story of Boxers, they also see the corruption that happens within the story of Saints. In fact in the Saints story everything is brought into a more concrete form. The characters around Vibiana are all too human and have human failings. The man who brought her into the Christian fold turns out to be addicted to opium, the man she lives murdered someone, and even the priest, her spiritual advisor, suffers from hubris. 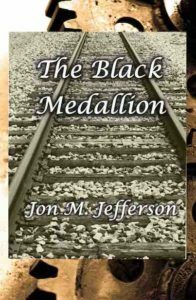 There are several areas within the stories that tie each of them together. The first is through a spiritual connection. Throughout Vibiana’s struggles she encounters visions of Joan of Arc and eventually a vision of Jesus. These mirror the visions that Little Bao has throughout his journey. They are spiritual advisors that show each of them the paths they will follow. The other area of connection is more concrete. Little Bao and Vibiana encounter each other at two different times in their lives. The first is when they are children, though what is only a passing moment for Little Bao, is part of the struggle that Vibiana has as four-girl. 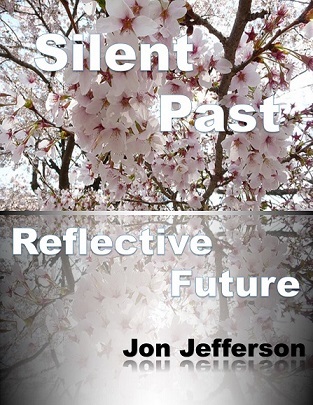 Later is the end of the story for Vibiana when the reader finds them together again. Little Bao makes the connection then but not Vibiana. It is in this moment that she tries to bring him back from the vigilante path he has chosen and he embraces the darkness that consumes him. Boxers is the longer story of the two, nearly twice as long, but it is also a more fantastic account of the uprising. The story gives the reader a view of the larger world and the effects our actions can have within it. The view that Saints offers the reader tightens that world view and lets them see what effects they can have on a smaller scale. Like I said, the books should be read together (or at least one after the other). These are great stories and a new way to explore the history of the world we live in. Sure there won’t be as many facts as might be found in an encyclopedia (do those even exist anymore?) but it is the stories that exist around us and the worlds that they come from that tell us more of what is really important in our lives. Halloween has come and gone, but that doesn’t mean we have to forget it. If you are still in a zombie mood for this great holiday spend a little time with A Death in the Family or maybe any of the books in the Hate Candy series. There is bound to be some monsters waiting around a dark corner for you. 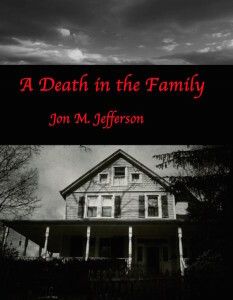 And just so you know, you can pick up A Death in the Family for free on Smashwords with coupon code YW68N until November 7th.